It's amazing to think that something as tiny as a honeybee, which we routinely swat away from us, can carry the fate of billions of dollars of produce and the food supply of a nation on its shoulders. But honeybees are an essential part of our ecosystem and they are threatened by modern agriculture. 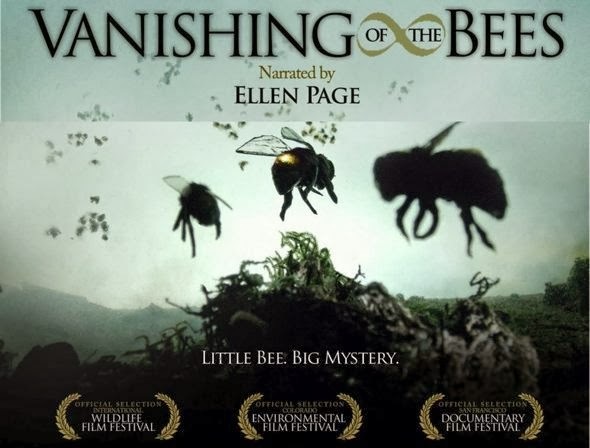 Vanishing of the Bees takes a look at the issue of colony collapse disorder (CCD). CCD is the term used to describe when a colony of bees disappears, leaving behind no dead bodies, but only the queen and a few young bees. No "official" scientific cause has been found for this phenomenon, though this film investigates the different possibilities. I've written about bees briefly before, where I mentioned I have always been scared of bees. After watching this film, I'm more in awe of them than afraid. Did you know one single bee can hit up 100,000 flowers every day? That's some productivity. Bees are responsible for pollinating $15 billion in crops in the U.S. alone. I think we owe them our attention. The documentary talks about the religious, historical and cultural significance of the honeybee and how for centuries, bees have been thought of as an indicator of environmental quality - the healthier the hive, the healthier the environment. If bees can't thrive, we can't either. Some who are proponents of organic/holistic beekeeping believe that it's a byproduct of industrial/commercial production of bees. Practices like artificially inseminating queens to select for certain traits (thereby reducing genetic pool) and taking honey away from the hive and replacing it with sugar syrups are blamed for compromising the health of the colony, making it more susceptible to diseases and sickness. Makes sense - that's happened for other animal species due to our industrial farming practices, so it's not too far fetched to believe it could happen to bees. More and more beekeepers and scientists started to look to our modern farming practices as the culprit. Our vast fields of monocultures are incredibly susceptible to pests, which explains the vast use of pesticides in our crops (you know, the same chemicals that were developed to kill people in WWII, which are now sprayed on our vegetables). But pesticides were put in use in agriculture years ago - and CCD is a more recent phenomenon. So how are they connected? Older versions of pesticides were sprayed on crops, and bees could be removed from the fields during spraying time. The pesticides were on the surface, where insects would eat portions of the leaves and die from system failures - not necessarily in the flower/pollen portion of the plant that bees access. If you had an issue where bees were affected by these pesticides, you would know it from the dead bees present. It was when systemic pesticides were introduced that bees started to be affected. Systemic pesticides are part of the plant's seed and express themselves in the growth of the plant through its life, including pollen and nectar, which makes bees susceptible. When these pesticides were introduced, the only testing done on them was whether or not a dose was lethal. One flower isn't enough to kill a bee, so they were deemed "safe" (or the risk was deemed "acceptable"), but no research was done on low level, sublethal doses - the kind that accumulate over time and are brought back to hives. These pesticides have been found in high levels in hives, but science has yet to prove that CCD is caused by them. I find it highly problematic in this country that minimal testing needs to be done to prove something is an acceptable environmental risk, but conclusive testing must be done to be able to take it off the market after the fact. Our government throws caution to the wind and relies on the industry to do its own testing instead of doing independent, third-party testing. (Sound familiar?) Even watching European countries such as France ban these systemic pesticides and see bee populations recover somehow doesn't convince people in our country to take the same action. We're too concerned about the welfare of our corporations and our greed. The film also suggests some things you can do to take action for the bees - contacting your legislators is one way, but buying local, unadulterated U.S. honey, refraining from using chemicals on your lawn, eating organic produce that doesn't use systemic pesticides, growing a garden with a habitat for bees with lots of flowering plants - those are all important ways you can make a difference. I can't recommend enough that you watch this film (I watched it on Netflix). Visit their website at www.vanishingbees.com and follow them on Twitter at @vanishingbees to keep up to date on the latest info about how you can help. For locals, check out Edible Allegheny's info on bees and CCD in western PA from their August/September issue. At the PASA conference in February, I attended a workshop on bees as research before we made our decision about bringing bees in. My husband's childhood experiences left with a severe case of "anything with a stinger is BAD". The speaker pointed out that in the several strains available to beekeeping, there are different temperaments and honey yield as well as winter hardiness. He cautioned that by choosing the higher yield strains or the more amiable strains all of the time also created a genetic "sameness" that made conditions ideal for mites. They believe mites are the #3 cause in CCD. Now, the Russian bees (not as user friendly or as productive, but excellent winter keepers) were studied. They found that as Russian workers walked over cells with larvae infected by mites, their legs were sensitive enough to "feel"" the mites. They then opened the cells, killed the infected larvae and avoided more contamination of the hive. The other two popular strains aren't able to do that. I found it sad (and fascinating) that in our attempts to manage even this simplest of creatures, we screw that up. :( We did decide to add bees this spring. You are welcome to come up and observe them while they are hibernating. We did not choose honeybees and these little guys are native to North America as well as being very docile.